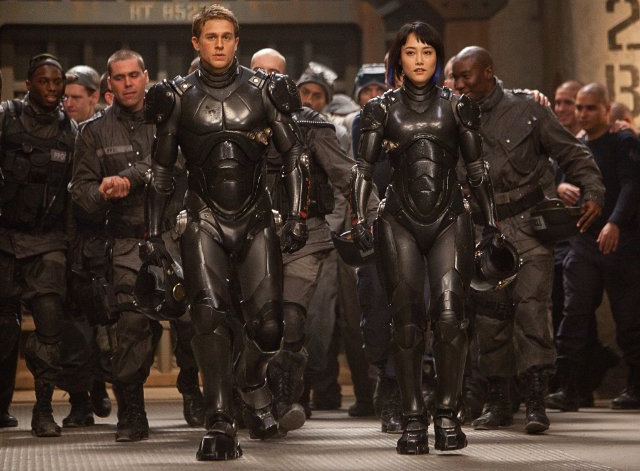 Charlie Hunnam and Rinko Kikuchi prepare to hop into a giant robot suit together and beat up giant monsters in "Pacific Rim" © 2013 Warner Bros. Bigger definitely is better in the hugely entertaining "Pacific Rim," a massive-scale mechanical-men vs. monsters blockbuster with a story as good as its special effects. Director/writer Guillermo del Toro ("Pan's Labyrinth," "Hellboy") combines heroics, humor and heart to create gold from elements previously wasted in such leaden dross as the groanworthy "Godzilla" remake, the terrible "Transformers" and the wretched "Real Steel." The most impressive thing about the "Pacific Rim" screenplay (co-written by Travis Beacham) is the way it makes the big-things-bashing-each-other sci-fi sub-genre seem fresh and fun. What we basically have here is a story about humans in gigantic armored suits known as Jaegers (German for "hunters") fighting humungous city-destroying aliens referred to as Kaiju (Japanese for "giant beast"). The mountain-sized monstrosities are invading Earth through a dimensional rift at the bottom of the Pacific, rising from the ocean one or more at a time to cause overwhelming devastation. The skyscraper-tall Jaegers are operated by brain-linked pairs of human pilots inside them. Think "Iron Man" gone super-duper-sized, each Jaeger packing ray guns and rockets and one heck of a roundhouse punch. Our Hero is Jaeger-meister Raleigh Becket (Charlie Hunnam of TV's "Sons of Anarchy"), drafted back into the international struggle after losing his brother in a vicious mano-a-monster confrontation five years earlier. The Jaeger program is about to be defunded by politicians who insist that colossal coastal walls will provide sufficient protection from invading aliens, despite all evidence to the contrary. Idris Elba is the manfully defiant head of the multi-nation Jaeger program who refuses to go quietly, especially in light of frightening conclusions drawn by his two hammily hilarious odd-couple researchers. Charlie Day is a loudly hyperactive biologist who wants to mind-meld with an alien brain. Burn Gorman is a theatrically manic mathematician who warns that bigger and nastier creatures are on the way. Japanese beauty Rinko Kikuchi ("Babel") perfectly fills the "underestimated spunky love interest" slot, as well as having the movie's most movingly melodramatic back story. Ron Perlman (who costars with Hunnam in "Sons of Anarchy" and who played Hellboy in the two del Toro movies about that comic-book character) appears as an enjoyably eccentric black-market dealer in alien body parts. The movie's amazing special effects occasionally become almost too much of a good thing, filling the screen with such towering characters that battle scenes can seem crowded and claustrophobic. Also, every large-scale fight takes place at night, which should be kept in mind when deciding whether to see the movie in the already dark 3D format. Those are minor complaints, though, considering how good-looking, imaginative and convincing the CGI action is. It's a blast to see how realistically modern technology can render city-smashing brawls that looked so silly only half a century ago, in early "Godzilla" movies and no-budget TV shows such as "Ultraman." In one of the most outrageously over-the-top scenes, a Jaeger uses a full-size ocean liner to club a Kaiju through the streets of Hong Kong. Director del Toro lets enough sly humor slip through to keep some of the carnage cartoonish, such as having a Jaeger box a Kaiju's ears with a pair of cargo-ship containers, or the way a menacing monster might wobble goofily after taking a knockout punch. Interestingly, "Pacific Rim" is yet another recent flick (following last year's "The Avengers" and this year's "Oblivion") with a save-the-day sequence that involves noble self-sacrifice and a great big nuke. It's nearly enough to make the conspiracy-minded wonder if we're being indoctrinated on how to stop worrying and love the bomb. "Pacific Rim" gives fleeting nods to things like post-9/11-style security mania, political ineptitude and economic inequality, but it's a real treat to see a comic-book-style movie that's not relentlessly real-world dreary or pretentiously self-important. Sometimes, being the ultimate giant robot monster spectacular is more than enough. Also, a bonus scene during the end credits will ensure that you leave the theater with an even bigger smile than the one you already will be wearing. Postscript: I originally saw this movie in 3D. Now that I also have seen it in 2D, I can confirm the obvious: SEE IT IN 2D! Most of the battles are at night or underwater, and 3D glasses further darken those already dark scenes. Also, the movie was converted to 3D after shooting, which never looks as good as shot-in-3D.